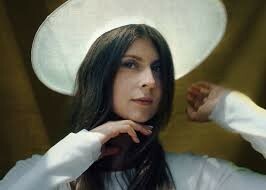 Lydia Ainsworth’s third album, Phantom Forest, introduces a lush, complex dream world that the singer, composer, and producer created and inhabited largely on her own. She produced all the songs, and wrote and performed everything on the self-released collection outside of a re-imagined cover of Pink Floyd’s “Green is the Color” and two other tracks (“The Time,” “Give It Back To You”), which started as instrumentals written by Survive’s Kyle Dixon (who composed the Stranger Things soundtrack with his bandmate Michael Stein), to which Ainsworth wrote melodies and added lyrics. You’ll get a sense of this from the collection’s edenic cover art and the playful, pastoral video for the album’s first single, “Can You Find Her Place.” Its inspiration came from Ainsworth’s love for Italian Renaissance painter Botticelli’s 15-century masterpiece “Primavera,” an allegorical representation of the burgeoning fertility of the earth in spring. She notes: “The video features the Greek gods of the painting in a choreographed Baroque style dance.” Keeping with the personal feel of the collection, her sister Abby Ainsworth directed the clip. Phantom Forest is a beautiful, vast collection that mixes the historical and the hands on, with hooks about the apocalypse and people obsessively using face-recognition software to see what paintings their face match with, in search of some kind of connection. It’s a journey that holds up to close listening (and lyric reading) and to dance floors, but that can also exist on a purely emotional plane. In all cases, it asks that you listen, and take some kind of action.